At this year's Auto Expo held in February, Kia Motors was the cynosure of all eyes and now it's common knowledge that the SP2, their global SUV, will be the first product they shall make and sell in India. But Kia is also looking at which of their other products could work in our very diverse and complex market. 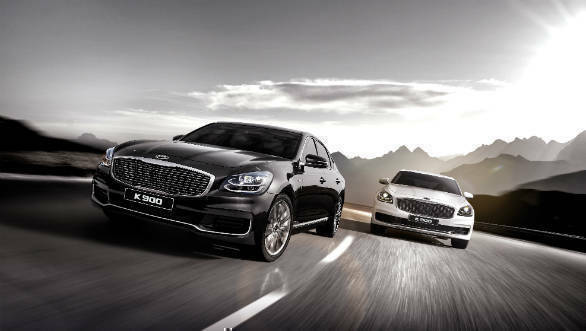 One such car is the K9 (Korean name), or K900 as it's known in global markets. This is Kia's most ambitious and expensive luxury car yet. The first generation K9 was introduced in 2012 and its completely new version broke cover only a few months back and recently we had the opportunity to sample it in Korea. 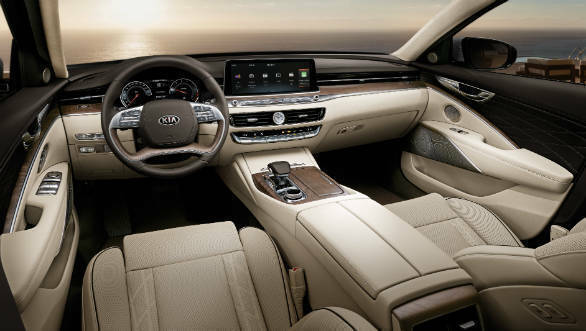 The K900 is a result of a collaborative effort by Kia's global design headquarters in Korea and its design studio in California. As in most Kia's, the focal point of the styling is the characteristic 'tiger-nose' grille. Interesting the portion on top of the front windscreen and also the bottom part of the smart four-spoke steering wheel, also have the 'tiger-nose' shape. The new K900 is bigger and has a longer wheelbase too, but the overhangs are shorter, to create more space in the interior. The K900's length is 5120 mm, width 1915 mm, height 1490 mm and wheelbase 3105 mm. In comparison, the extended wheelbase Mercedes-Benz E-Class sold in India is 5063 mm long, 1860 mm wide, 1494mm tall and the wheelbase is 3079mm. So the new Kia K900 is evidently much longer and wider and its wheelbase is lengthier too. While the K900 is quite large and has a substantial road presence, the styling is somewhat dull and sadly part of the rear is reminiscent of BMW's, making one wish Kia had opted for an original design. But what is really good is the jewellery and ornamentation the K900 wears. 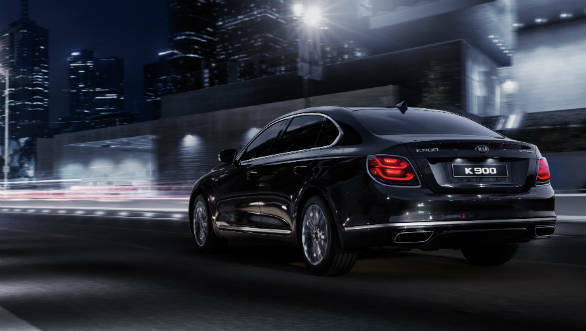 The somewhat small headlamps that flank the extremely big grille feature twin-LED DRL's (daytime running lights) and even the taillights have a dual LED graphic design that provides the K900 with a distinctive night signature. Such geometric details add an element of modernity and chrome is also used to brighten the looks. The highlight of the Kia K 900 has to be the passenger compartment. It has a very smart design with an emphasis on simplicity and user friendless and Kia have also been enormously liberal with the application of high-quality real woods, leathers, and well-finished metals with a premium feel. The quality of workmanship is of an exceptional quality and the entire interior oozes class and luxury. The large digital 12.3-inch screen looks more like a tablet and has state of the art graphics and displays maps, trip information, audio sources, climate control status, etc. The K900 also offers smartphone integration with Apple CarPlay and Android Auto and allows users to access their apps and stream music on-the-go. The console also has a wireless smartphone charging pad. 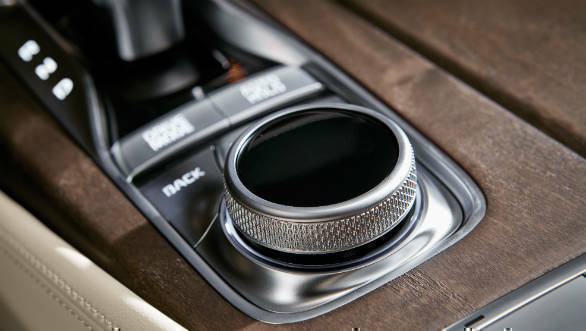 A tasteful touch is the elegant analogue clock placed in the centre of the dash. It is exclusively designed and created for the Kia K900 by Swiss luxury watchmaker Maurice Lacroix. It took over a year to develop this clock, and it is such attention to detail that should help Kia assert itself as a manufacturer of refined luxury cars. The seats are well-contoured and shaped for maximum comfort. Both front and rear seats have well over a dozen electric adjustments including width-adjusting bolsters, lumbar support with power air cells and shoulder adjustments, height-adjustable headrests, moveable cushions, etc. To create the desired ambience the Kia K900 comes with a mood lighting system developed in conjunction with Pantone Institute, the global authority on colour. Of the 64 colours available, Pantone created seven specific settings inspired by light and its interplay with different elements of nature like the ocean, the forest, the skies and even the Aurora Borealis. 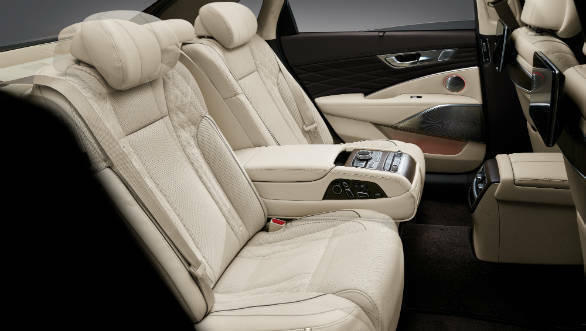 The K900 comes with a premium audio system and NVH levels in the cabin are appreciably low too. But the feature that impressed me the most is the 'Blind Spot View Monitor' or (BVM). This comes on whenever you use the turn indicators and provides a live video feed of adjacent lanes in the instrument cluster. If you indicate you are turning left the images are displayed in the speedo and on turning right in the rpm meter. This system works incredibly well and is a great example of advanced technology being applied in a most practical manner. In fact, this feature has made such a strong impression on me, that I wonder why it's taken a manufacturer so long to introduce it. Hopefully, this is something more car makers will now start offering soon and maybe in time, it can also be made mandatory. 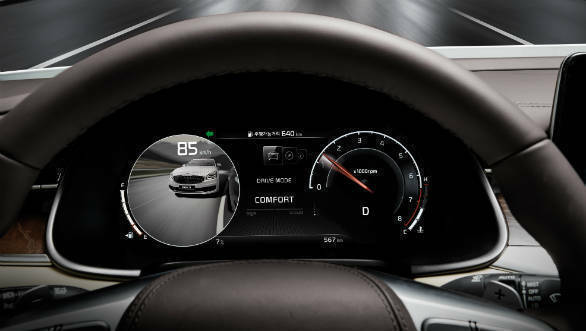 The K90 has a head-up display and comes with lots of driver assistance systems like - Lane Keep Assist System (LKAS) which supplies a degree of automatic steering control based on detection of lane markings and radar-based front vehicle information. 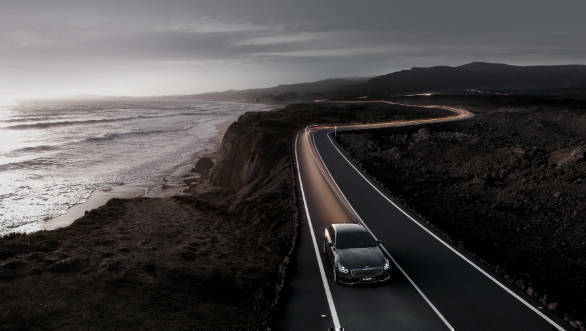 The K900 also offers Forward Collision Avoidance Assist (FCA), Driver Attention Warning (DAW) and Rear Cross Traffic Avoidance Alert (RCAA), which automatically applies the brakes if it detects an object is closer than the specified distance. 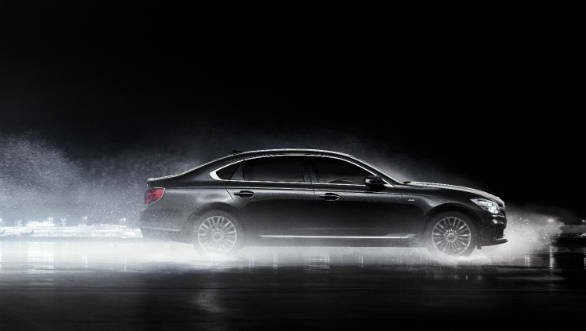 The new Kia K900 is available with a choice of four petrol engines. Three of these are V6's, two naturally aspirated and one a twin-turbo. All have different power outputs with the turbo charged one producing 370 PS and 510 Nm of torque. 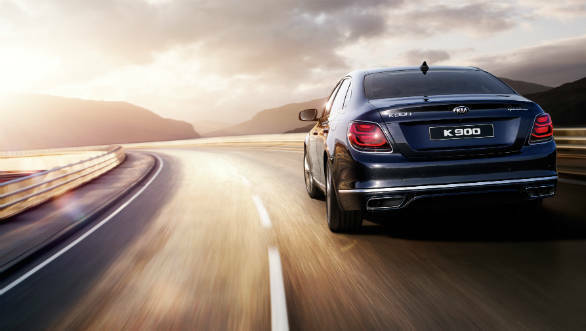 The K900 is also offered with a naturally-aspirated 5.0-liter V8 that generates 425 PS and 520 Nm of torque. This is the most powerful production engine Kia has ever made and it's silent and smooth and eager in its power delivery. 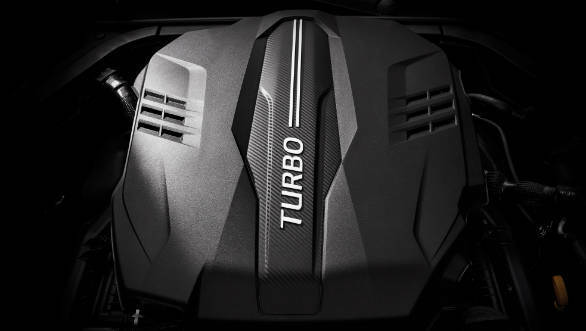 All the engines are married with Kia's slick shifting 8-speed automatic transmission that sends power to all four wheels via a full-time Dynamic Torque Vectoring Control all-wheel-drive system. This AWD system is rear biased and can distribute up to 50 percent of torque to the front wheels and up to 80 percent to the rear wheels in Sport mode. The Kia K900 has a much more rigid platform than before for better driving dynamics. Though we could not really push it on Korea's crowded roads, the ride quality was impressive and supremely comfortable. Of course, since the roads are so good, the suspension was not tested the way it would be in our country. The electromechanical steering is precise and offers a fair amount of feedback. 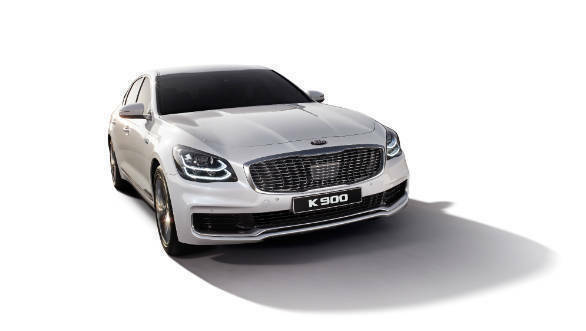 Acceleration is rapid and the Kia K900 feels responsive and refined and comes across as a luxury car with rather sorted driving dynamics and the kind of overall performance that is expected in this segment. 0 to 100 kmph times are said to be around 6 seconds. The braking performance is first-rate too and underbody cooling ducts guide air to cool the brakes and enhance their performance. The system features standard Corner Brake Control and Brake Fade Compensation, which are designed to automatically increase the hydraulic pressure in the braking system as the rotor temperatures rise to maintain a more consistent brake pedal feel. There's also a brake drying feature that can periodically apply the brakes (undetectable to the driver) to sweep water build-up and maintain consistent performance. Again all this is something we could not test on our short drive. So should Kia bring the K900 to India and will it do well? In my view, for a car that should easily cost over 50 lakh rupees, the K900 will face a big challenge. Simply because it does not have a German or European badge. Indian buyers of premium products are very particular about the brand image and the prestige attached to it. So until the time, Kia's brand has the same kind of lure and brilliance of its competitors, I think most Indians will be reluctant in shelling out the big bucks for it. Your feedback is most welcome of course.